By the looks of it SCAR FOR LIFE seems to be more of a project than a full time band. Alex S after the split up of REDSTAINS decided to move on and for this, he created SCAR FOR LIFE. This Portuguese act seems -as I said- like a project since Alex is responsible for almost everything including the production. 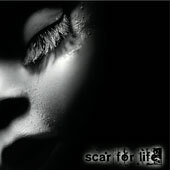 Either way, SCAR FOR LIFE released their debut a couple of months ago through their website via free downloading. Only for this, the band deserves some additional credit since this is not customary in the Metal market. But, times change and maybe this is the next step for the bands; to take full control of the promotion and stay away (and safe) from the record companies. When I realized that SCAR FOR LIFE come from Portugal I thought that it would belong to the Gothic ala MOOSPELL scene. For unknown reasons I have connected all the Portuguese bands with the aforementioned Gothic Metal act and I was pleasantly surprised when I pressed the play button. Kill The Past enters with distinct guitars and fast tempo that clearly looks towards the Swedish Metal scene and -to be more specific- towards IN FLAMES. No, it is not something that you can find in the pile of the Gothenburg sound influenced bands. SCAR FOR LIFE seem to have something new to offer; the vocals draw an almost unique path with a special timbre and vibrato that simply cannot go unnoticed. The use of growls and screams is rather limited and mainly stay in the background so you can strike out the classic clean versus brutal vocal recipe. My Last Words partially satisfies my 'urge' to characterize their music as Gothic Metal since the mid tempo, the haunting keyboards and the deep vocals clearly belong to this genre. But SCAR FOR LIFE avoid the 'road to prediction' by leaving aside the cliches and working more on the Metal aspect of the music. Some PARADISE LOST finishing touches can be found in the guitar riffs in Insomnia that also comprises catchy vocal melodies and harmonies. One By One kicks in harder than the rest with double drum pedaling, hearty bass guitar sound and fast riffs that kind of reminded me of SCAR SYMMETRY's latest works. I believe that Alex S kept some strains attached to his previous band REDSTAINS and added some fresh elements. Due to this approach the album sounds like it is developing song by song; many different influences pop up making the band's music signature rather vague. Of course, this is a matter of self exploration and taking into account that this is their debut I bet they will work on this direction. Until then, we can enjoy this debut and support the band by downloading the album for free, adding them in our myspace friend list and telling our friends about them. You can watch below the promotional video clip for My Last Words and get an initial taste about the band.